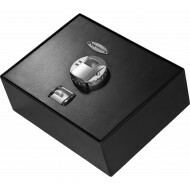 This is a top opening biometric handgun safe from Barska. Designed for a drawer, you would open the drawer, press your finger to the the finger pad and your safe would immediately open. Two hydraulic hinges help the top pop open to make your access very quickly. This biometric lock is easy to program with your fingerprint and other users if you wish. Also it is easy to delete a fingerprint and reprogram in another one. The battery simply operates with four AA batteries which can be changed from the outside. For your convenience, overide keys are included.